One minor objective of a recent junket to Chiang Mai was to sample a regional specialty, a dish of egg noodles simmered in a mild coconut curry. Chunks of meat or fish and an obligatory side of pickles complete each serving of khao soi, a meal that satisfies through sheer simplicity and an unknowing nod at each food group in the nutritional pyramid. Khao soi is thought to have originated among Chinese Muslim traders who braved the mountain passes that linked Yunnan, Burma, Laos and Siam in a time of absolute rulers and relative rules. Some settled at hubs along these routes, building communities around riverine mosques and blending culinary elements acquired during their travels with ingredients of local picking. Thus, some suggest that the Cin Haw spiced up a Burmese soup called ohn-no-kyaukswe with chilli and crunchy toppings of deep-fried noodles; others see an etymological link with a tribal concoction made from rice cakes cut into thin strips and added to a gamey broth. Over time, Cin Haw settlers replaced rice with egg and enriched the soup with coconut milk, despite the paucity of this raw material in a region of deep valleys and high ranges. 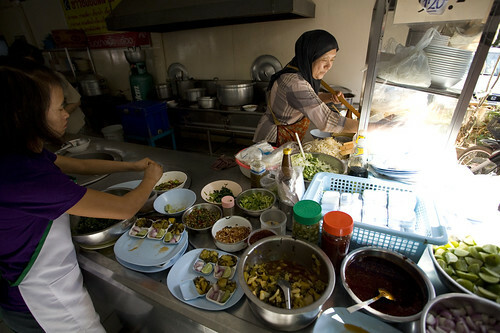 Located in a lane of small eateries and a makeshift market near the Ping River, Khao Soi Islam offers a motley choice of northern Thai cuisine amid plain tables and rickety chairs. Pride of place, however, goes to khao soi, which the establishment serves with a choice of beef, beefballs, fish or chicken. Packs of trademarked dry noodles line shelves by the entrance, but only here, at a corner manned by a lady with absolute mastery over the bowls that surround her workspace and the girls who convey orders and deliver plates, can a hybrid dish be savoured fresh and flavoured with a sauce of foreign tradition. While we waited for our lunch, a family of Singaporeans passed by and stepped in with audible caution. Their cursory survey of the premises was enough to prompt a hasty retreat to presumably safer and more sumptuous quarters. But it did little to discourage those who were already seated: gangs of wrinkled men, families led by coiffered dames, the odd angmo wielding chopsticks with random dexterity. The noodles arrived without fuss, with generous portions of tart sides and crispy strands that invade every corner of the mouth and temper the warm, subtle notes of a meal drowned in silk and destined to play second fiddle to palates inured by richer fare. The Khao soi noodles look delicious and healthy. I never try the coconut juice to use in noodle soup.